The largest carbon emitter Britain is to stop burning coal to comply with EU laws, and will instead burn imported American wood chips. 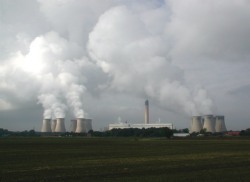 Running on coal, Drax has long been a symbol of Britain’s energy industry, but its move to biomass means it is fast becoming a symbol of our confusing and convoluted present day energy policy. Built right next to the Selby coalfield in the Seventies for easy delivery, and expanded in the Eighties, it is easily the largest power plant in the UK. It burns 36,000 tons of coal a day, single-handedly emitting more CO2 than any other source in the country. These carbon emissions combined with government policy are leading Drax to make the switch to biomass, as current plans will soon make coal too expensive. The UK is committed to producing a third of its energy from renewables by 2020, and biomass is considered ‘renewable’ as the theory says that burning wood (or other biomass, like grain) only emits the amount of carbon it took from the atmosphere for the tree to grow. This though, doesn’t take into account all of the carbon emissions that arise from processing, transporting and storing the wood chips, which could be high enough to make the carbon savings negligible. From April 2013, there is to be a mandatory carbon price floor of £16 per tonne of CO2 emitted, set to rise to £30 per tonne by 2020, and likely to more than double again by 2030. It is this new carbon tax being brought in by the Chancellor George Osborne, that is forcing Drax to make the change for financial reasons. The CBI has already called for carbon-intensive industries to be exempt from the carbon price floor. As well as taxing coal so highly, the government has decided that any coal plants burning ‘biomass’ (wood, in this case) qualify for a near 100 per cent subsidy, like onshore wind farms currently do, which will paid for by every household and business through their energy bills. What we now have is a power plant designed to burn coal, creating the same amount of energy from burning wood chip, but at double or triple the total cost. This will inevitably be passed on to the end consumer, as the government tries to subsidise low carbon energy by placing sky high taxes on fossil fuels. This month will also see the closure of many of our remaining coal-fired power stations, leaving us even more dependent on imported gas, which is likely to drive prices even higher.